The aim was to produce a piece of modular, articulated jewellery using reclaimed and alternative materials. Once I'd refined the construction, decided on shape, form, materials etc, I found couldn't stop. So, I made the whole set, earrings, bracelet and necklace. The little cones are made of batik fabric covered in a sticky backed plastic. 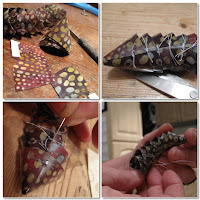 I glued them and then stitched each cone to the next until I had long articulated snakes. The necklace and bracelet are also strung on wire, for strength, shape and to attach a clasp. The result is very comfortable, tactile and certainly not like anything I have ever made before. I had hoped this course would take me to new places as a jeweller. The new pieces look reallly great. I love articulated things. What are you going to make next?